My family and I are blessed to be able to participate in the Angel Food Ministries through our local church. We as a family have participated by purchasing some of the meals to help with our food budget and needs over the past year and now we get to have a local site and also serve other people who participate. It is a really good program. 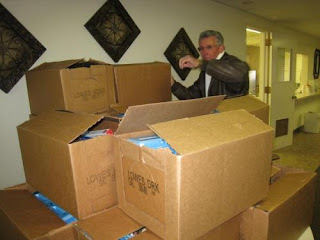 Our church had over 47 families served last month with over 100 boxes being distributed. This month we will be handing out some more items on this coming Saturday! The day starts awful early for my DH who willingly gets up at 4:30am and bundles up with longjohns etc. 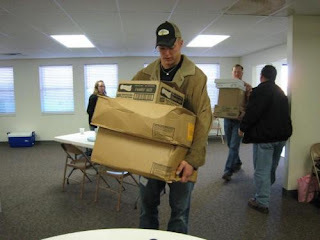 to make an over 1 1/2 hour drive to the nearest large city to pick up the churches order, load the items and also help load up the over 12 churches who are also picking up and then heading back to our church and unloading everything for us to sort and deliver. 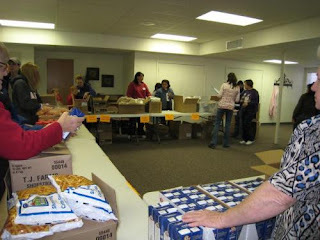 Check out the national link for Angel Food Ministry and see if you and your family could participate as well.